What is the TripAdvisor Certificate of Excellence? Home to over 730 million reviews and opinions covering the “world’s largest selection of travel listings worldwide,” TripAdvisor is an essential platform for every hotel or hospitality executive. The website’s Certificate of Excellence award is one of the most coveted badges of honor for businesses in the travel sector. It can help set your business apart from your competitors and give you more visibility on TripAdvisor. TripAdvisor has been handing out the Certificate of Excellence since 2011 to honor hospitality businesses that deliver consistently great service across the world. 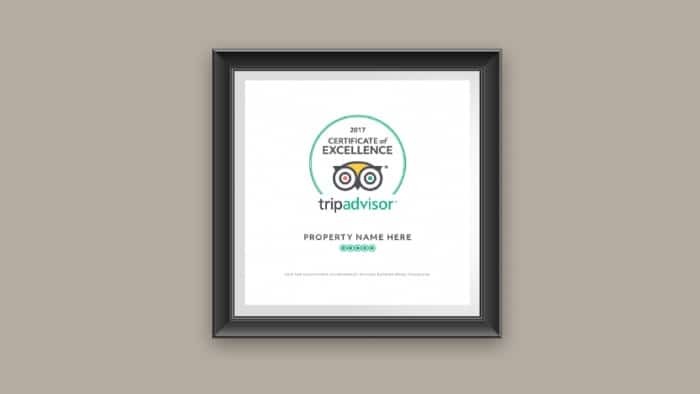 Yes, there is an actual physical certificate that you can order, print out, and display in your property (given, of course, that you are a qualified recipient of the award — keep reading for more on how to order your certificate); the Certificate of Excellence is also displayed on TripAdvisor business pages and listings. Approximately only 10 percent of businesses listed on TripAdvisor receive the Certificate of Excellence. There’s no application process for the Certificate of Excellence. The achievement is earned over time by businesses that are able to collect great reviews and high ratings on TripAdvisor. Accommodations (hotels, B&B and inns, and specialty lodging), restaurants, attractions, and vacation rentals worldwide are eligible to get the TripAdvisor Certificate of Excellence. The Certificate of Excellence is only valid for one year, so businesses will need to continue their high standard of service in order to get the award again for the following year. If you qualified last year, but not this year, the badge will be removed from your page. TripAdvisor Certificate of Excellence recipients are announced in late May every year. This means that your business must be listed on TripAdvisor for a full 12 months between April 1 and March 31 to be considered for the award. It’s best to avoid faking reviews and giving your business 5-star ratings on TripAdvisor, since the site uses an algorithm to look at any “content integrity issues, animal welfare policies, and/or fraudulent activity” connected to the listing. If you meet the above criteria for qualifying for the Certificate of Excellence, you can take extra steps to earn the certificate. Respond to reviews. Businesses that get back to reviewers ASAP are found to have higher average ratings than those that do not respond. Read the guide on how to respond to TripAdvisor reviews. Encourage customers to review you on TripAdvisor. Your happiest, most satisfied customers can be powerful word-of-mouth catalysts. Position yourself to qualify for the Certificate of Excellence by developing a strategy around getting more TripAdvisor reviews from customers, who may already be poised to give you five stars and just need a little nudge. Don’t fake your reviews. Remember: TripAdvisor checks for fraudulent behavior, which, if found, will disqualify a business from being recognized. What is the difference between Travelers’ Choice and Certificate of Excellence? Both awards are based on the millions of reviews, ratings, and opinions from users on TripAdvisor. The Travelers’ Choice, however, is a little more prestigious. It is TripAdvisor’s highest honor, and it identifies and ranks the very best businesses such as hotels, destinations, islands, attractions, restaurants, etc. in specific categories and geographies. Travelers’ Choice award winners make up about 1 percent of all listings on TripAdvisor. How will I know if I received the Certificate of Excellence? To find out if your business received the TripAdvisor Certificate of Excellence, simply visit your business page on the site. Qualified businesses will have a Certificate of Excellence badge displayed on their page. If you have registered and claimed your listing on TripAdvisor, you will also receive an email notification in late May (when winners are announced) with details about your achievement. What is the TripAdvisor Certificate of Excellence Hall of Fame? Listings that get the TripAdvisor Certificate of Excellence for 5 years in a row enter TripAdvisor’s Certificate of Excellence Hall of Fame. For example, 2019 Certificate of Excellence recipients qualify for the Hall of Fame if they were recognized in 2015, 2016, 2017, 2018, and 2019. How can I order the TripAdvisor Certificate of Excellence? Congratulations on being a TripAdvisor Certificate of Excellence recipient! Showcase this achievement by ordering the physical printed certificate and displaying it in your property. Sign into the Management Center on TripAdvisor. Look for the Marketing Tools menu at the top of the page, then select Awards* in the dropdown menu. Click on Get your Badge next to your Certificate of Excellence widget. Click on the Display a Certificate link at the bottom of the page. Fill out the Certificate of Excellence Request form and click the Submit Request button. It takes up to 8 weeks before you receive your Certificate of Excellence in the mail. * Please note that the Awards section in Marketing Tools will only show for businesses that have qualified for an award or recognition currently or in previous years. Is there some sort of algorithm that determines the winners each year or is it by committee?